You are here: Home > Blog > Energy, sustainability & economics > Why trees don’t grow tall in the same way as people …. The reason for this is that trees only grow in areas called meristems where they form new cells. Cells are created by cell division (mitosis) within the meristems, and these cells then expand and specialise. These growth areas are found at the tops of the trees, and the tips of branches; these are "apical meristems". Growth also happens in the apical meristems at the ends / tips of the tree's roots. Another form of meristem is found in the trunk, called the vascular cambium, this allows outward and not upward growth of the trunk. 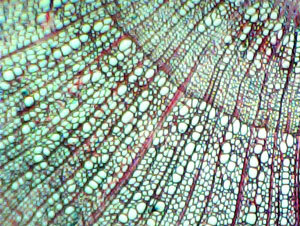 As the vascular cambium produces new xylem (water conducting) and phloem (sugar transport) tissue, so the trunk increases in diameter. These patterns of growth have important consequences. For foresters, it means that they need techniques for making the tree concentrate its growth efforts on the meristematic regions in the top of the tree rather than in the shoots of the side branches. 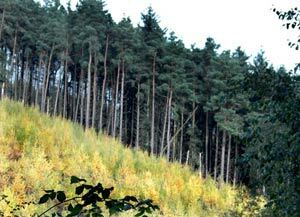 This is usually done by planting trees close together so that in their search for light they get taller rather than spreading out sideways (see featured image above). They continue to add girth through the vascular cambium along the whole length of the trunk. Once the trees have become bigger and taller some of the trees can be thinned out without creating sideways growth. 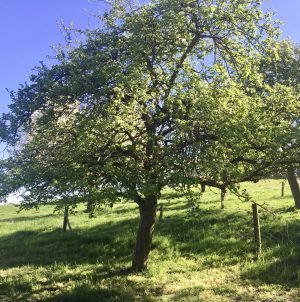 For fruit tree growers the way the tree grows is important because they want to create a good spread of branches bearing fruit at a suitable height. In many cases this means planting a tree whose branches are already spreading at a height that works for fruit picking but also regularly pruning the top shoots that want to take the growth to levels that are too high to harvest easily. You can see the effect of this growth pattern when you find a bit of fence or wire in a tree - it is found at the lower level of the trunk and although the trunk may well have enfolded the wire or metal the fencing does not get carried up the tree to a new level. Interestingly, in a plantation of a single species, once the canopy closes the height growth is the same regardless of how close the trees are to each other (the stocking density). This phenomenon is the basis of the Yield Class system, whereby the timber volume increment on a given area of land can be calculated as it is a function of height growth which in turn is dependant on genetic and environmental factors. For a given yield class of a particular species, the volume increment on a hectare of woodland over a period of several years will be the same regardless of the stocking density. This will be the case even if the trees are thinned over the period as long as the matginal thinning intensity isn’t exceeded. So it is the forester’s aim, if growing to maximise the average tree size in a plantation, to start with the trees relatively close together to suppress side branches which form knots in the timber and encourage straight upward growth due to competition for light. After the trees have closed canopy the plantation can be thinned. This allows the same volume increment to be shared over fewer trees so each one is of a larger volume, due to the increased diameter growth resulting from the extra growing space for the remaining trees. The timing of thinning depends on factors such as the local market for small roundwood, whether the trees are shade tolerant or more light demanding (light demanding species tend to “self thin” and “self prune” to a degree), the exposure of the site and soil stability, availability of labour and machinery and access routes, and so on. It can be a challenging operation logistically! How old is that tree ?